Compliance, Administration, Accounting, Disclosures & Reporting . Which one? Don’t choose? Bramasol and SAP leasing solutions make it all possible. With deep expertise in lease accounting, we are not only product experts, but solution experts who help you select the right solution to meet your needs. Using our LASER methodology we deliver a solution that not only complies with ASC 842 and IFRS 16, but is natively integrated with your SAP finance system (or any other) and is secure, scalable, and flexible. Check out why the Fortune 500 choose Bramasol. On January 06, 2016, the International Accounting Standards Board (IASB) issued International Financial Reporting Standards (IFRS) 16 Leases. IFRS 16 replaces several accounting standards and interpretations including: International Accounting Standard (IAS) 17, International Finance Reporting Interpretations Committee (IFRIC) 4, Standing Interpretations Committee (SIC) 15, and SIC-27. IFRS 16 sets out the principles for the recognition, measurement, presentation and disclosure of leases. On February 25, 2016, the Financial Accounting Standards Board (FASB) issued Accounting Standards Update (ASU) 2016-02, Leases (Topic 842) also known as Accounting Standards Codification (ASC) 842. The new leasing standard ASC-842 presents dramatic changes to the balance sheets of lessees. Lessor accounting is updated to align with certain changes in the lessee model and the new revenue recognition standard ASC-606. The new leasing standard ASC-842 supersedes ASC-840 and was issued to increase transparency and comparability among organizations by recognizing lease assets and lease liabilities on the balance sheet and disclosing key information about leasing arrangements. Both IFRS 16 and ASC 842 are the result of the International Accounting Standards Board’s (IASB’s) and Financial Accounting Standards Board’s (FASB’s) efforts to meet that objective of improved transparency and comparability while improving financial reporting. Just as the new Revenue Recognition standard (IFRS 15 and ASC 606) was a joint project between the FASB and IASB, the Leasing project began in a similar manner with many of the requirements in Topic 842 the same as the requirements in IFRS 16. However, unlike the converged standard for Revenue Recognition (IFRS 15 and ASC 606), the new leasing standard is not converged. This means there are differences in how the two accounting standards handle certain accounting transactions. The main differences between Topic 842 and IFRS 16 are in relation to certain aspects of the lessee accounting model. In contrast to the lessee accounting model in Topic 842, which distinguishes between finance leases and operating leases in the financial statements, the lessee accounting model in IFRS 16 requires all leases to be accounted for consistent with the Topic 842 approach for finance leases. Consequently, leases classified as operating leases under Topic 842 will be accounted for differently under GAAP than under IFRS and will have a different effect on the statement of comprehensive income and the statement of cash flows under IFRS 16 than under previous IFRS standards. Whether you are just beginning your introduction into the topic of Leasing or are well underway with your project to implement the new standards, Bramasol has the experience, resources, and industry knowledge to help you take advantage of this opportunity to transform your business. For finance leases, SAP has completed a multi-year development effort to improve their SAP Real Estate Management offering. 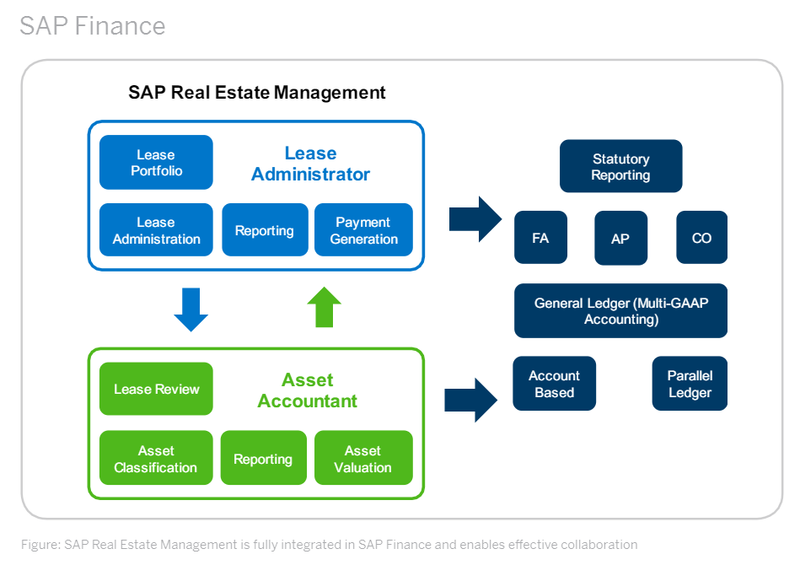 SAP Real Estate Management enables close collaboration between the lease administrator, lease accountant, and fixed asset accountant. They access the same lease record, with all calculations being based on the terms and conditions of the abstracted lease. The lease transaction in SAP Real Estate Management provides separate authorizations to ensure a clear separation of duties. In addition to capturing contract terms and conditions, SAP Real Estate Management is specifically designed to support real estate leasing processes such as managing critical dates, exercising renewal options, early terminations, rent escalations, sales based rent, common area maintenance, and service charge settlement. Lease administrators can attach all leasing documents to the SAP Lease Contact as well as store notes and generated correspondence. The highly flexible and extendable forms collect industry- or business-specific attributes and enables users to stay ahead of the game. 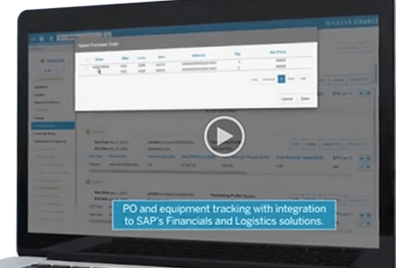 Periodic posting runs automatically generate all lease payments based on the terms of the current lease agreement with real time integration into SAP Financials. For operational leases, they are currently reported off balance sheet and disclosed in the notes of financial statements. However, in the coming years, organizations will be required to capitalize many of these operating leases and record them in their balance sheets as assets and liabilities or obligations. While this is a significant change in how businesses are meant to manage their leases, early adoption and planning can provide many benefits including greater visibility on lease exposure and reduction in spending. Ultimately, to prepare for the new standards, organizations need better, tighter integration. They need a framework that provides an efficient mechanism to collect the data needed to meet the new accounting standards. SAP’s Contract and Lease Management (part of the SAP REFX Solution) creates a unified leasing contract data repository that can be accessed to leverage accurate and relevant data for the optimization of the lease accounting processes particular to your business, transactional processes such as equipment management, supplier management, business planning, and more. As a natively integrated solution that provides end-to-end lifecycle management for all your leases, SAP CLM is the best choice for SAP customers. CLM is fully integrated to SAP ECC and S/4 HANA and leverages your master data and GL without costly, complicated or difficult integrations. Additionally, as it has been certified by PWC to produce accurate calculations and make the correct journal entries you can rest easy when it comes time for your audit. Combined with Bramasol’s disclosure packages and validation reports you have a jump-start on your ASC 842 and IFRS reporting requirements. Bramasol works with you to evaluate the system changes needed under the new regulations, determine how significant they will be going forward, and lay out a path toward implementation with an emphasis on the impact to the SAP system. 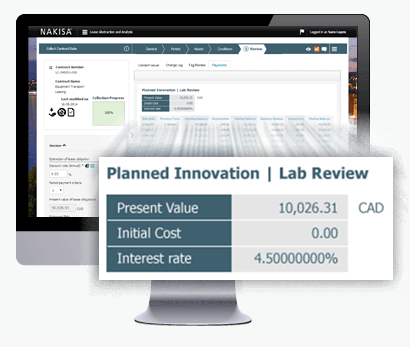 As a partner of both SAP and Nakisa, we provide a holistic view to the impact the new Leasing standard will have on your organization. Our methodology and approach will help ensure that you can meet the upcoming changes to the standards.